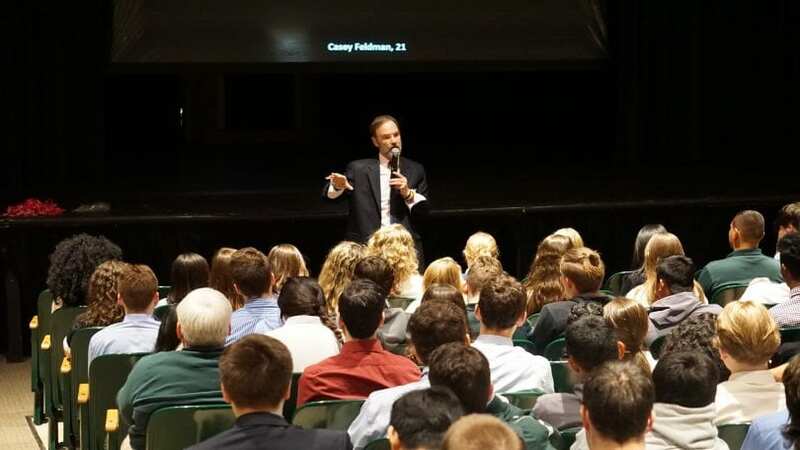 The founder of the Casey Feldman Foundation, whose 21-year-old daughter was killed by a distracted driver, gave a riveting presentation to students at Northwest Catholic High School in West Hartford. Northwest Catholic’s entire student body gathered together on May 14 for an important presentation on distracted driving. Just days before the prom and weeks before summer break, it was the right time to remind Northwest Catholic’s young drivers about the dangers of driving distracted. Joel Feldman, father of Casey Feldman (1988-2009) and founder of the Casey Feldman Memorial Foundation, held his audience riveted as he shared stories about his daughter Casey and how she died nine years ago after being struck by a distracted driver. Casey was using a crosswalk in the middle of the day as she headed toward her summer job. She was struck by a distracted driver using his GPS, and she died five hours later in the hospital. Casey was a senior at Fordham University. Again and again, Feldman said, drivers use this explanation or respond to the tragedy they caused with these simple words: “only a few seconds.” He continued with other commonly heard remarks: “It was an important call,” “But I’m a safe driver,” or “I was never in a crash before.” These specific statements were easy to imagine, mostly because most, or all, of the drivers in the audience had made these remarks themselves. Half-way through the presentation Feldman invited a guest to speak. Alex from Lyme, now a student at Trinity College, killed a man when Alex crossed the median and struck an oncoming car. Alex reflected on his experiences as he came to understand the weight of his responsibility and what it felt like to be forgiven by the man’s widow. He told the story of sitting down with the man’s family and reading them a letter he had written. The man’s widow asked Alex to continue to talk to people about distracted driving, and so he is. Feldman showed video clips of people driving distracted, and the audience winced as they watched cars run through stoplights and fought back tears as both perpetrators and victims described the aftermath of tragedies triggered by distracted driving. 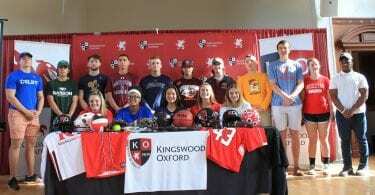 Feldman looked at the young faces before him and said, “More of you will be killed by a distracted driver than a drunk driver.” He explained that car crashes are the leading cause of death for people ages 5-24, and nearly 60 percent of teen crashes are caused by distraction. Feldman claimed we’ve done a good job educating people about the dangers of drunk driving, but we haven’t convinced them of the dangers of driving distracted. Throughout the presentation photos of Casey crossed the large screen. Feldman didn’t need to say this but he did anyway: “She had everything in front of her.” That truth wasn’t lost on Northwest Catholic’s students. Any one of them could be a Casey Feldman. They knew it. To learn more about Casey Feldman and the foundation her family has established in her name, visit https://www.caseyfeldmanfoundation.org/.